Grief is a powerful emotion, and sometimes it brings out the worst in people. If you’ve been to enough funerals, you’re bound to have witnessed some inappropriate behavior. Sometimes you can say or do something to let them know they made a manners mistake or give them some tips on proper funeral etiquette. However, don’t make a spectacle of yourself or the issue by arguing. 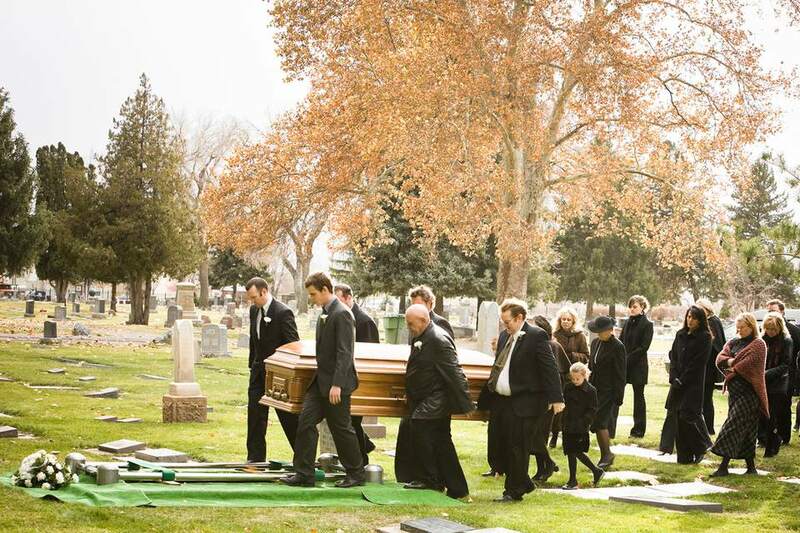 If the problem persists, talk to the funeral director who is trained to deal with all kinds of situations. People who have never attended a funeral before may not know that it’s important to wear understated clothing to a funeral service. If someone shows up in clubbing attire or something she might wear to the beach, there’s nothing you can do short of snubbing her. Since you should assume she’s there to show her respects and participate in the service, that’s not normally a good idea. After arriving, she has probably noticed that she’s not dressed properly for a funeral, and hopefully, she’ll learn from her mistake. You have other choices if you want to help a close friend or relative who will be open to your assistance. When someone shows up in a ratty T-shirt or strapless dress, you may offer your jacket. That will let her know that her outfit isn’t right for the occasion, and you’ll be helping her cover her faux pas. Eulogies are speeches about the deceased, typically delivered by people who knew the person well. They may be somber and filled with sadness, or they might be light and entertaining. Whatever the case, it’s important to show respect for the speaker by being quiet and listening. Chattering from the pews can be quite distracting and disrespectful. If you’re sitting next to someone who tries to engage you in conversation, gesture toward the speaker to show that you are interested in what she has to say. If the people behind you start chatting, glance over your shoulder to let them know you can hear. Most people will get the hint and stop talking. Many parents leave their children with a sitter because they’re not sure the little ones are equipped to deal with proper funeral behavior. However, if the child is directly related to the deceased or is close friends with a family member, it is okay to bring them as long as they know what is expected of them. Before the funeral, refresh your child's memory the list of basic manners you expect. When you see other people’s children acting out—whether they’re running around or making too much noise—you may mention something to their parents if you know them. However, if you don’t know them, it’s better for the funeral director or a clergy member to deal with it. Some people experience spontaneous laughter that is a result of nervousness or not knowing what to say. When someone starts laughing at a funeral, do your best to ignore him. His urge to laugh will probably subside as long as no one makes a big deal of it. However, glaring at him or saying something about it might increase his inability to control his chuckles. A funeral is the time to show respect, so when you hear someone saying something negative about the deceased during the visitation, change the subject. If the person doesn’t take the hint, you may say something like, “I want to remember the good things about him.” If the person persists in saying bad things, excuse yourself and find someone else to talk to. Some people think they have the right to ask nosy or sensitive questions about the deceased, such as the person’s financial affairs, his will, and his family relationships. If someone asks you one of these questions, you can leave it unanswered and change the subject. If the person persists, just say you’d rather not discuss that topic. Some people may not understand the order of the procession to the gravesite. Whether you are in an automobile funeral procession or walking to the gravesite, participants need to understand the order. The family normally goes first, followed by very close friends, and then acquaintances. Some funeral directors announce the order, but some people may not hear or understand. When someone goes out of order, you can whisper something like, “Why don’t we let the immediate family go ahead of us?” This will normally take care of the matter. Typically, the first couple of rows at a funeral or gravesite are for family members. If someone else starts to sit in that area, quietly mention that the seat is reserved for family. Chances are, they weren’t aware of that, and they’ll find another spot. There are some people who refuse to attend funerals. Perhaps they had a bad experience in the past, or they can’t face the sadness of being surrounded by those in mourning. Maybe the person had unresolved issues with the deceased. Whatever the case, the dread of being there is real and can be overwhelming. If you know someone who says she can’t deal with going to a funeral, you can offer to be a buffer between her and anyone who may upset her. If she continues to decline, don’t push. There are times when staying away is the best thing. Some people are going to be rude, no matter where they are. This is a reflection of their improper upbringing, bad social skills, or lack of respect for others. Most of the time, you can drop a hint that will evoke some sort of behavioral correction, but not everyone is open to that. If it appears that the person isn’t taking the hint, you can bring up the subject to the funeral director and let him deal with it.